Driving While Black - VOD Review - ReDVDit! Driving While Black is a 2016 dark stoner comedy directed by Paul Sapiano. Starring Dominique Purdy and Sheila Tejada, the film is a humorous and realistic portrayal of racial profiling and the unfairness of the police toward ethnicities, especially African-Americans. Toeing the line between stoner friend comedy and poignant drama on civilian/police relations, this film succeeds in both areas. 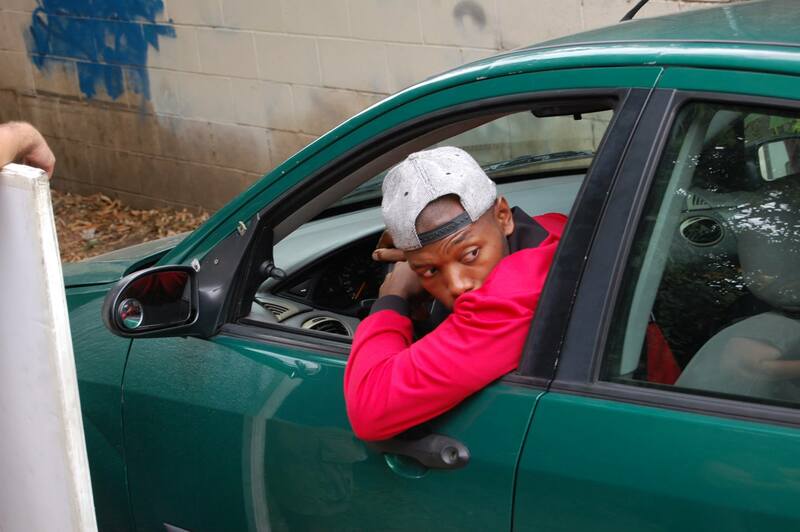 The film begins by following a young African-American, Dimitri (Dominique Purdy), who’s driving down the road. A cop spots him, turns on his lights, and pulls him over. It looks like every typical “pulled over” scene, until the cop becomes extremely aggressive. Yanking on Dimitri roughly, the cop slams him to the ground. The cop’s voice becomes satanic and his eyes glow black. Two other cops arrive to assist him, but they wear KKK masks over their outfits and taunt the flailing arrestee. They curb-stomp him, and the film cuts to Dimitri waking up from a bad nightmare. This wild opening serves to perfectly set up the off-putting and underdog vibe of the film. Starting with police brutality, the audience already knows the kind of issues the film will be touching on. And this works in its favor; the film immediately brings up a hot-button issue in an unsettling yet outlandish way as if to say “This film is about police brutality. Deal with it.”, all said while the film smokes a joint. The plot revolves mostly around the day to day life of Dimitri, and while truthfully the plot is very thin and often disregarded for a good scene, the film doesn’t suffer for it. The recurring scenes of Dimitri’s interactions with the police are the highlights, as they serve as the perfect plot device to illustrate the issues of racial profiling. Each time the police arrive, I tensed up, knowing this very well could end poorly for Dimitri, and occasionally it does. Never having undergone this struggle, the film is eye-opening at the sheer amount of caution African-Americans must go through to prevent repeated interactions with the police and yet still do. If this film can make a police car feel like the shark in Jaws slowly approaching its victim, it definitely succeeds in its endeavor of portraying an accurate depiction of police abuse. Dominique Purdy does a great job as the protagonist, Dimitri, and it is evident that he has experienced these situations before. His disdain for the police is real, and the realness of his performance makes the film seem less like an outlandish comedy and more like a personal tale of police issues. The police also do an amazing job at portraying monstrous, hateful people in one scene, and kind, well-founded people in another. The actors and actresses who portray the police carry a sense of authority not only in their uniforms, but in their faces, and it is refreshing to be afraid of the “villain” of the film while still understanding they are human beings. No one is improperly vilified, their actions stand for themselves. The comedy in this film is also a stand-out, with Dimitri acting as the funny friend we all have, doing bits and impressions throughout to amuse himself and his friends. The film also relies on stoner humor, like the stumbling daze of a really good strain and uses the medium creatively to portray this experience. There’s also an entire scene devoted to Dimitri roasting a tour guide and it’s one of the highlights of the film comedically. Visually this film is beautiful. Many shots of the city and police cars are almost picture frame worthy. The story that is told visually through the dark nights and aggressive lights of the cop car really put this film above the others on similar issues. The use of art and graffiti in the background also adds a nice layer to the film, and a scene often ends with a shot of a beautiful graffiti art on a worn-down wall depicting police violence. What struck me the most was how the film treated the police. Often, the police in films are shown as either the people’s heroes or racist homophobes with no in-between, especially on films about police brutality. 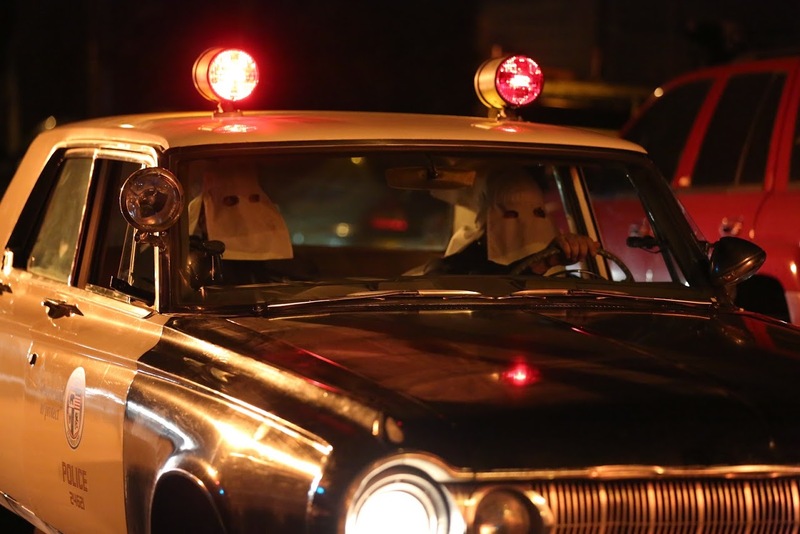 This film subverts all preconceived notions on how the film will handle cops by doing it all. The film primarily features a duo of profiling and douchebag cops, which is expected, but the film also portrays cops through a Filipino woman who is married to a black man, a white police chief who shuts down all of the duo’s racism, and the occasional black police officer acting as a median between Dimitri and the law. All these aspects of the police force allow the viewer to formulate their own opinions on the police as a whole rather than shove one particular viewpoint down the viewer’s throat, which is commendable. Balancing the positives and negatives of something so fragile as the police’s public perception takes great skill, and the various encounters with the police excel at portraying the police in both a negative and positive light. Driving While Black will be getting a limited theatrical run beginning on February 1, 2018. Afterwards, a DVD release as well as a VOD release for home viewing will be announced. This film is an absolute success as both a comedy and a thoughtful drama. 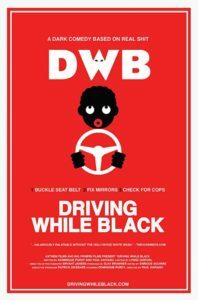 While it may not have been created with the intent of supporting a movement, Driving While Black creates a realistic and balanced view on racial profiling that can rarely be found. The acting, writing, and cinematography all stand out and support the film without feeling like they take away from the film’s overall themes and messages. The comedy is on point, and the feeling of watching your friends chill out in a car is perfectly captured. Driving While Black is a delight to watch and I am happy to have been given the opportunity to have seen this film.